It will be a day to remember loved ones who have passed away when the South Carolina Botanical Garden holds its first-ever Day of the Dead, Día de los Muertos, celebration from 6 to 9 p.m. on Friday, Nov. 2, at the garden. Clemson University’s annual homecoming celebration will kick off Friday with the 62nd annual Tigerama Pep Rally. It will take place in Memorial Stadium at 7 p.m.
Clemson University joins the nation in celebrating Hispanic and Latinx Heritage Month through Oct. 15. A highlight will be a visit from civil rights activist Christine Chavez, granddaughter of Cesar Chavez, the co-founder of the National Farm Workers Association, which later became the United Farm Workers. Clemson University will hold a 9/11 remembrance ceremony on September 11, 2018, at 5:00 p.m. in Tillman Hall’s Memorial Auditorium. The event is being coordinated by the student organization Tiger Platoon, which promotes awareness of Clemson’s rich military heritage. A Microsoft senior researcher and Harvard University fellow will visit Clemson University Sept. 14 to discuss ways social research and technology innovation must work collaboratively to protect privacy as human interaction moves increasingly online. Clemson's annual Welcome Back Festival will be from 6 to 8 p.m. Monday in downtown Clemson. 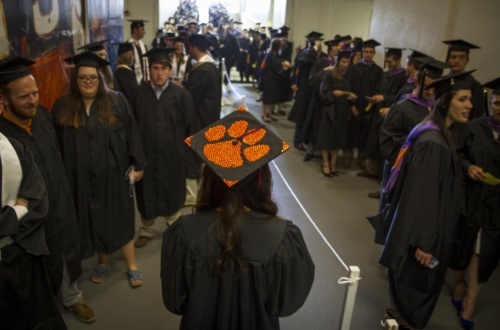 Clemson University will confer approximately 1,000 degrees during the summer graduation ceremony at 9:30 a.m. Friday at Littlejohn Coliseum. Visitors should plan extra time for travel and note the new clear bag policy implemented for graduation.